Sandwiched between Santa Rosa National Park and Rincón de la Vieja National Park--the other two parks in the Guanacaste Conservation Area trio--this incredibly diverse and endearingly rustic national park is one of Costa Rica’s least visited. Hiking trails connect the park’s various biological stations and sectors, offering intermediate to difficult paths for which a professional guide is highly recommended. Trail hiking, if you’re not here for scientific research. Varied ecosystems, which are incredibly diverse and range from arid lowland savannah to highland cloud forest. The park’s two volcanoes, Orosi and Cacao, are prime attractions. Nearby coastal resorts. Hotspots for fantastic lodges include Papagayo, Playa del Coco, Playa Hermosa, and Tamarindo, within one to two hours from Guanacaste National Park. At 84,000 acres, Guanacaste is roughly the size of the U.S. Virgin Islands. Guanacaste National Park is extremely rustic, but there are restrooms and scientific equipment, since the park houses the Guanacaste Conservation Area’s administration building, as well as the Maritza Biological Station, Cacao Biological Station, and Pitilla Biological Station. Camping is permitted within the park, and the biological stations offer dormitory bedding, dining services (by request) and other amenities, including trails and potable water. Primitive hiking trails leave from each of the park’s three biological stations, traversing various ecosystems and connecting one sector to another. A professional hiking guide may not be required, but is highly recommended. Hiking without a guide can be dangerous, as trails are rugged and there are no facilities between the park’s sectors. Guanacaste is home to dozens of biology researchers at any given time, attracted to the park’s astounding biodiversity. On deep hikes, you’re likely to spot the Maritza Biological Station, Cacao Biological Station, and Pitilla Biological Station. The park’s ecosystems are varied, but to generalize, Guanacaste National Park is dry; it does receive 118 average inches of annual rainfall, courtesy of its highland cloud forests. High winds are common, especially from January through March; rains increase during these months, as well. Average temperatures range from 19-28 C (66-83 F). The rainy season lasts from May to December; dry season is January-April, although some areas of the park still receive regular rains during that time. Other areas see very little rainfall, even during the rainy season. For planning a visit, the dry season is preferable, since the park’s trails are very rustic and therefore even more difficult to traverse when muddy. 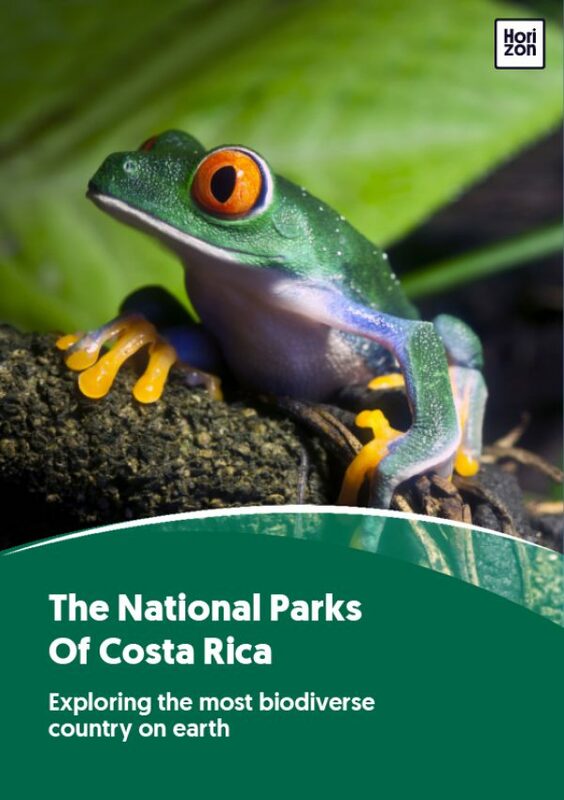 Guanacaste National Park’s ecosystems are diverse and unlike the rest of Costa Rica. There are extremely dry savannahs, similar to the African plains, as well as extensive tropical dry forest, high volcanic terrain (think: moonscapes) and, in the higher elevations, cloud forest, where rain is common along the Guanacaste Mountain Range. The park is home to 40 species of mammals. Among their ranks are white-faced monkeys, jaguars, tapirs, peccaries, pumas, tayras and armadillos. The 300+ birds include Montezuma oropendola, three-wattled bellbird, collared aracari, bare-necked umbrella bird, and northern caracara. There are over 100 species of amphibians and reptiles including eyelash palm pit vipers. Over 10,000 species of insects (including 5,000 butterfly and moth species) creep and crawl here. As a whole, the Guanacaste Conservation Area is estimated to give refuge to 65% of Costa Rica’s species (235,000!) and 2.6% of the world’s total biodiversity. Located in the north of Costa Rica, Guanacaste is 35 miles (1 hour, 15 minutes) north of Liberia and 57 miles (2 hours) northeast of Playa del Coco. To get there, fly into Liberia (LIR); most park visitors stay along the northern Guanacaste coast, in the hubs of Papagayo, Playa del Coco, Playa Hermosa, and Tamarindo. There is no public bus into the park; a car or guided tour is required. Any of the three biological stations are reachable by vehicle.